The word “orthodontics” may make you picture a mouth full of metal, but aligners provide a discreet and effective alternative to metal braces for most orthodontic issues. At their practice in The Woodlands, Texas, expert dentists David B. Epstein, DDS, and Nikita Vakil, DMD, help men, women, and teens straighten their teeth with aligner treatment. To find out how aligners can help your teeth look and function their best, call or click today. Dr. Epstein and Dr. Vakil proudly offer clear aligners, an orthodontic treatment that gradually and gently adjusts your teeth using a series of custom-made plastic aligners. Aligners are a nearly invisible alternative to traditional metal braces and causes minimal discomfort. 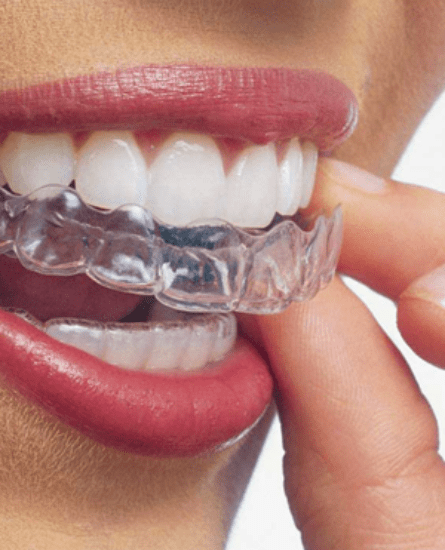 If you feel self-conscious at the thought of traditional metal braces, aligners can provide an excellent alternative, as people won’t even be able to tell you’re wearing an orthodontic device. The aligners are also removable, so you can eat and drink whatever you want and easily brush and floss your teeth as normal. Unlike with metal braces, you don’t have to worry about wires irritating the inside of your mouth or soreness after an adjustment. Aligner technology has evolved to treat most common orthodontic problems, including crowding, gaps, overbites, underbites, and crossbites. Not only do straight teeth look better, but they’re easier to take care of, so be sure to ask your dentist if Invisalign is right for you. What can I expect from clear aligner treatment? At the beginning of treatment, Dr. Epstein and Dr. Vakil take an impression of your teeth and go over your orthodontic treatment goals. They send this information to a lab, which creates your aligners. You wear each set of aligners between 20 and 22 hours a day for 1-2 weeks, and they gradually shift your teeth into the correct position. You come in for follow up every 4-6 weeks, your dentist checks on your progress and gives you the next few sets of aligners. As you adjust to each new set, you may feel some light pressure for 2-3 days. The aligners usually takes about a year to produce the desired results. You can expect to see a small but noticeable difference in your smile after 2-3 months. After you’re done with the last set of aligners, you receive a retainer. For the first few months, you have to wear the retainer during the day, but after that, you only have to wear it at night. Dr. Epstein and Dr. Vakil recommend aligners for adults and older teenagers with mild to moderate orthodontic issues. Though aligners are a comfortable and convenient option that effectively treats most alignment issues, you may need another form of orthodontics if your problems are beyond what aligners can do. Generally, aligners aren’t an appropriate option for children younger than age 14. Children’s teeth are still growing, which would complicate treatment, and children may not be mature enough to fully commit to treatment. To learn more about clear aligners, schedule a consultation by calling or clicking today.